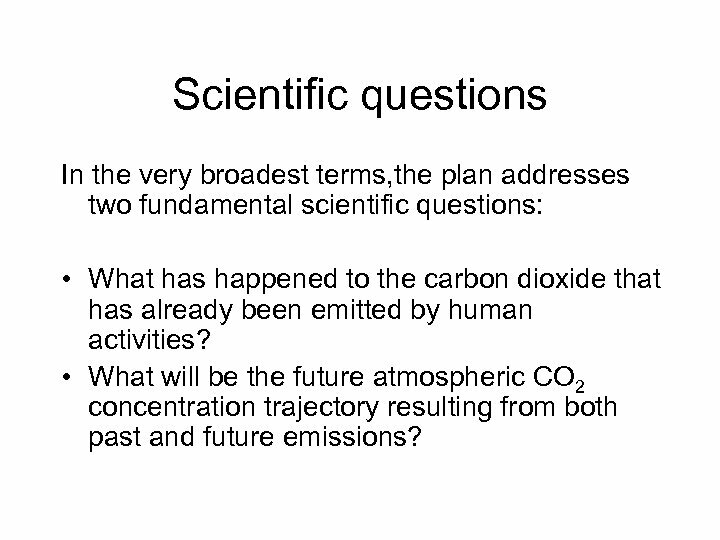 Scientific questions In the very broadest terms, the plan addresses two fundamental scientific questions: • What has happened to the carbon dioxide that has already been emitted by human activities? • What will be the future atmospheric CO 2 concentration trajectory resulting from both past and future emissions? 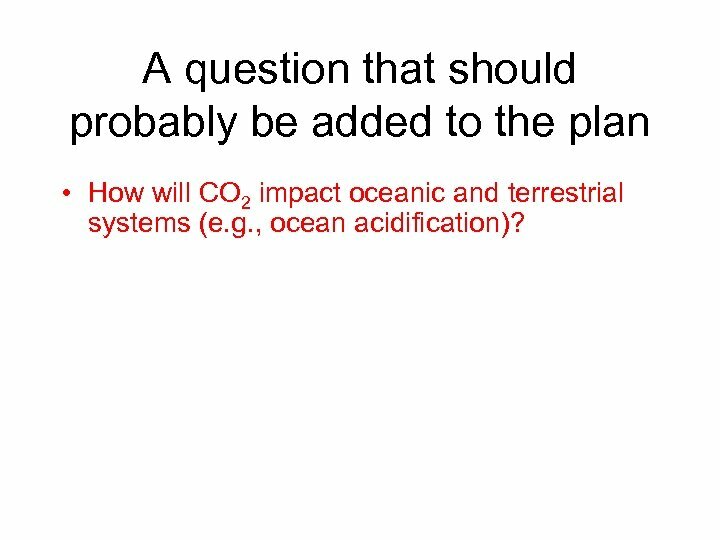 A question that should probably be added to the plan • How will CO 2 impact oceanic and terrestrial systems (e. g. , ocean acidification)? 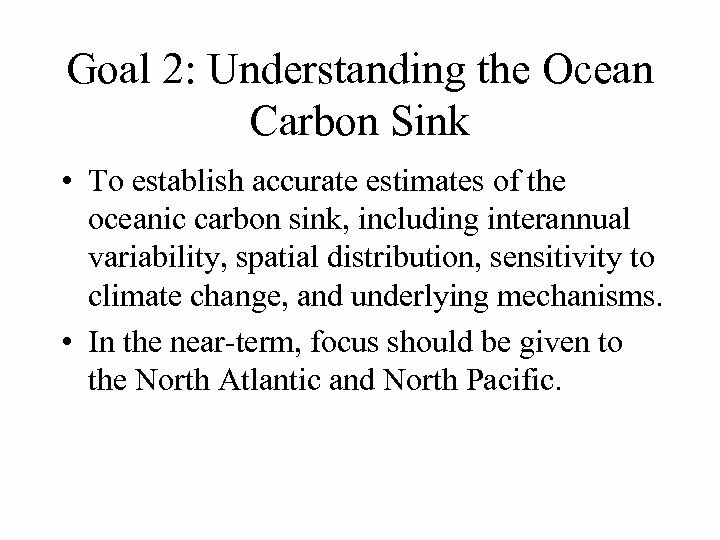 Goal 2: Understanding the Ocean Carbon Sink • To establish accurate estimates of the oceanic carbon sink, including interannual variability, spatial distribution, sensitivity to climate change, and underlying mechanisms. • In the near-term, focus should be given to the North Atlantic and North Pacific. 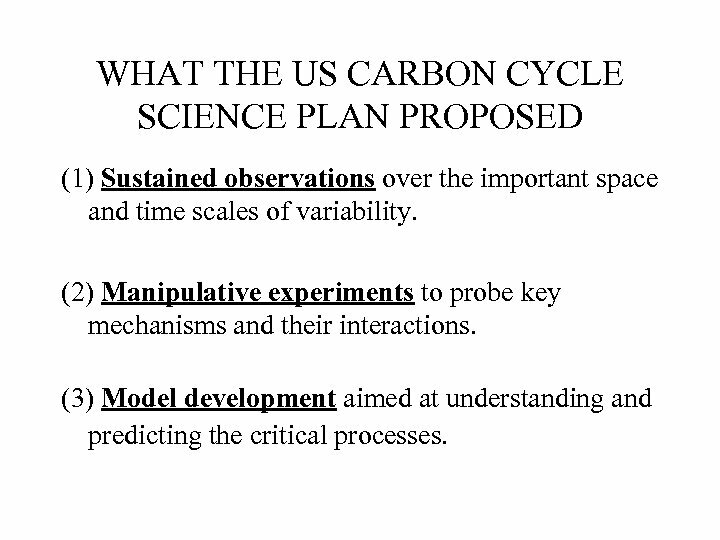 WHAT THE US CARBON CYCLE SCIENCE PLAN PROPOSED (1) Sustained observations over the important space and time scales of variability. (2) Manipulative experiments to probe key mechanisms and their interactions. (3) Model development aimed at understanding and predicting the critical processes. 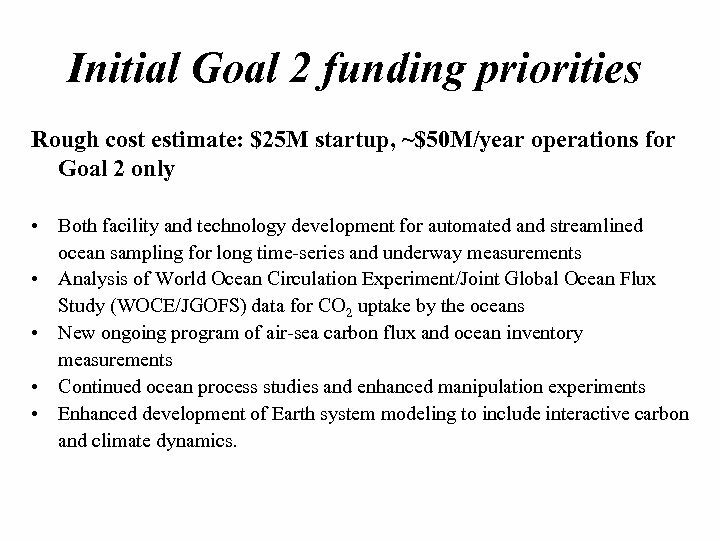 Initial Goal 2 funding priorities Rough cost estimate: $25 M startup, ~$50 M/year operations for Goal 2 only • Both facility and technology development for automated and streamlined ocean sampling for long time-series and underway measurements • Analysis of World Ocean Circulation Experiment/Joint Global Ocean Flux Study (WOCE/JGOFS) data for CO 2 uptake by the oceans • New ongoing program of air-sea carbon flux and ocean inventory measurements • Continued ocean process studies and enhanced manipulation experiments • Enhanced development of Earth system modeling to include interactive carbon and climate dynamics. 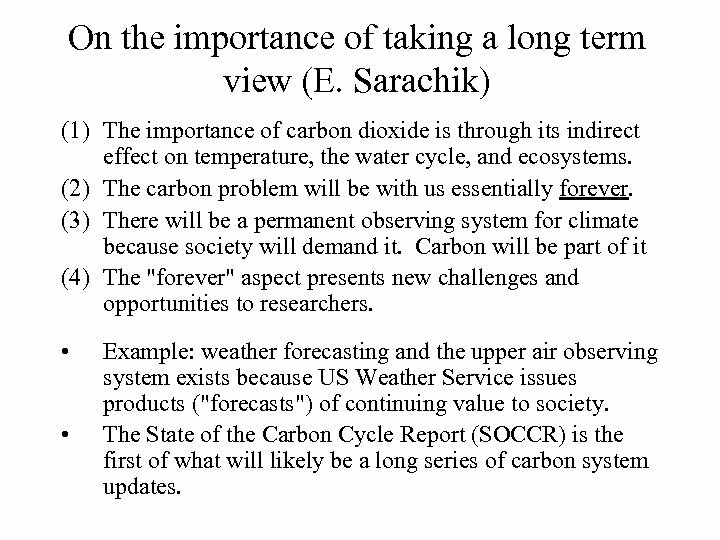 On the importance of taking a long term view (E. Sarachik) (1) The importance of carbon dioxide is through its indirect effect on temperature, the water cycle, and ecosystems. 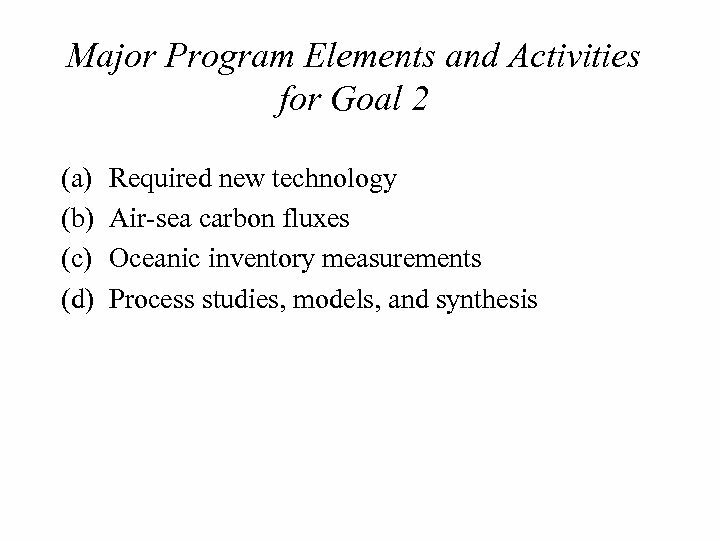 (2) The carbon problem will be with us essentially forever. 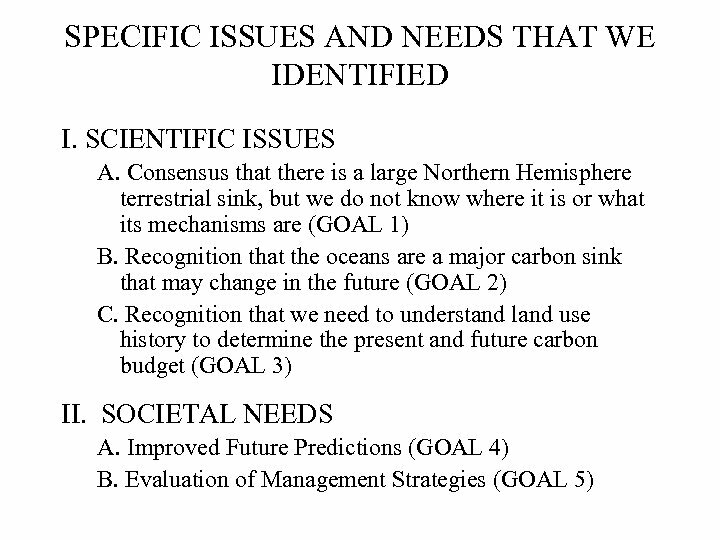 (3) There will be a permanent observing system for climate because society will demand it. Carbon will be part of it (4) The "forever" aspect presents new challenges and opportunities to researchers. • • Example: weather forecasting and the upper air observing system exists because US Weather Service issues products ("forecasts") of continuing value to society. 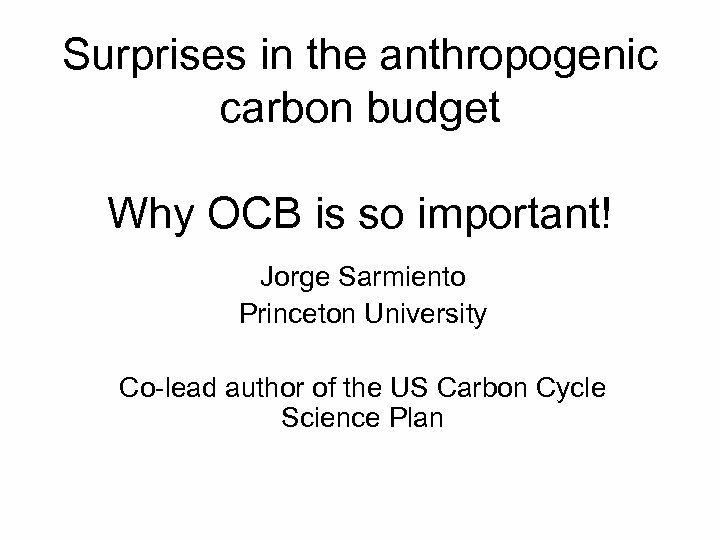 The State of the Carbon Cycle Report (SOCCR) is the first of what will likely be a long series of carbon system updates. 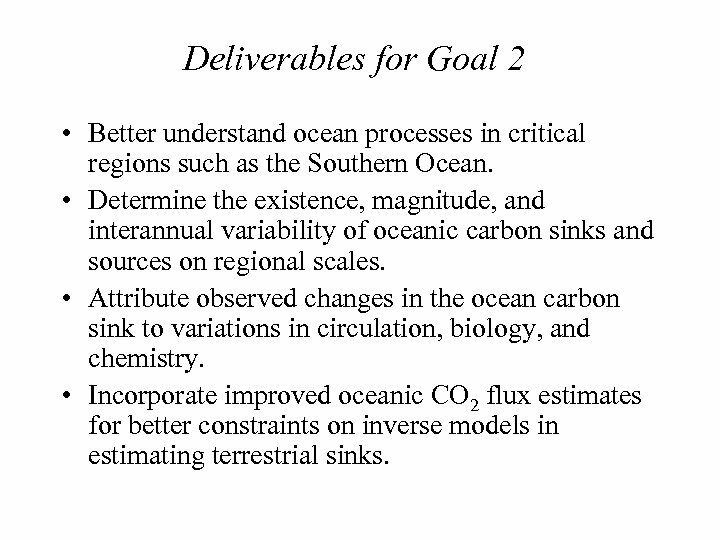 Deliverables for Goal 2 • Better understand ocean processes in critical regions such as the Southern Ocean. 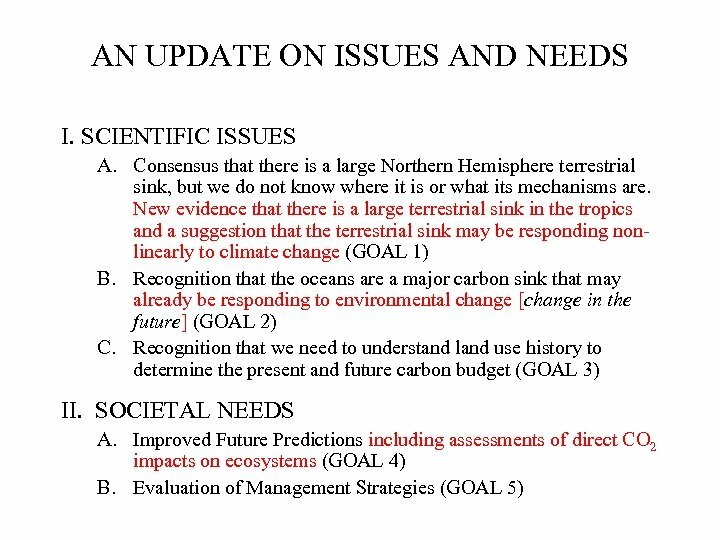 • Determine the existence, magnitude, and interannual variability of oceanic carbon sinks and sources on regional scales. 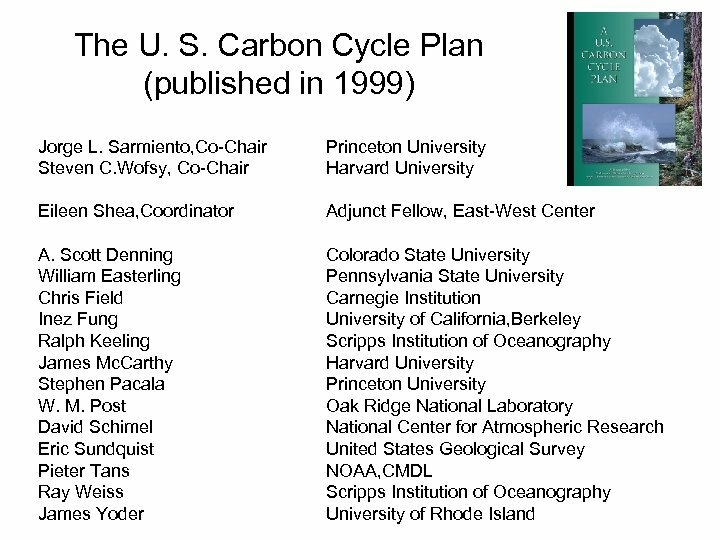 • Attribute observed changes in the ocean carbon sink to variations in circulation, biology, and chemistry. • Incorporate improved oceanic CO 2 flux estimates for better constraints on inverse models in estimating terrestrial sinks.